Shimla (Vijyender Sharma) : Former chief minister of Himachal Pradesh and Lok Sabha MP Shanta Kumar has dropped a letter bomb on the BJP, demanding a "Lokpal" in his party to tackle cases of corruption like Vyapam and Lalitgate, which, according to him, "made all of us bow our heads in shame". In a letter to BJP president Amit Shah, he said that the series of recent scandals had dented the government’s image. The revelation came into the public domain on the eve of the monsoon session of Parliament, at at time the Opposition is pressing for the sacking of Madhya Pradesh chief minister Shivraj Singh Chouhan over the Vyapam scam, and Rajasthan chief minister Vasundhara Raje and foreign minister Sushma Swaraj over their favours to former IPL chief Lalit Modi. The 80-year-old veteran leader has pressed for the setting up of an "ethics committee" that acts like a Lokpal to "keep a check on leaders in the government". 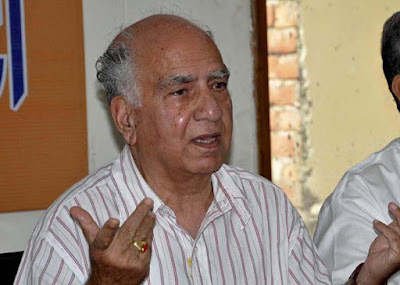 The BJP has snubbed Shanta Kumar over his concerns, saying that he is paying heed to the Congress' propaganda, and distanced itself from his views. Union minister for skill development and entrepreneurship Rajiv Pratap Rudy said, "We generally consider Shanta Kumar a very mature leader. But it seems that he has been carried away by the propaganda of the Congress. Whatever he has said or written, we completely disassociate with Mr Shanta Kumar's version." The veteran BJP leader, however, defended his position: "I have written the letter and I stand by every word of it. Our party has made glorious achievements. It won with glory, formed government and ran it for a year with glory. After that stains have started to appear in places. With achievement, your head is held high. Stains cause pain in the heart,". Borrowing from the PM's popular radio chat, Kumar said that he stands by the charges he has made - his mann ki baat. He is the first high profile BJP leader to take a dig at party president Amit Shah and, to an extent, even Prime Minister Narendra Modi for the way they have handled the Lalitgate and Vyapam episodes. Kumar is one of the rare leaders known for his clean and taint-free political life, and this is not the first time he has raised the red flag in the party. In April 2002, whilst holding the portfolio of Union minister for food under the Atal Bihari Vajpayee government, Kumar severely criticised then Gujarat chief minister Narendra Modi for failing to control the riots in the state. Modi's term in office was beyond human norms. Shanta Kumar had then made statements like "If I were in his place I would have quit" and "What has happened in Gujarat after the Godhra incident is inhuman. The burning of the train must be condemned in the strongest possible terms. But what happened thereafter would shake the conscience of any right thinking and self-respecting man". At the time too, the BJP and the Sangh had distanced itself from Kumar's demands. A senior RSS leader was quoted as saying, "When Modi was [BJP] general secretary in charge of Himachal Pradesh, from where Shanta Kumar comes, he did not allow Kumar to fill the state party posts with his yes-men. Modi had sidetracked Kumar. That is why Kumar is talking about resigning if he were in place of Modi." So did Shanta Kumar nurture hatred against Narendra Modi for helping his rival Prem Kumar Dhumal in the state unit? He may have. But he continues to hold important positions in the party and is a member of Parliament for the BJP. The veteran leader had tendered a written apology to the then BJP president Jana Krishnamurthy for criticising Narendra Modi in the national media and seeking his resignation. In 2003, the BJP lost Assembly elections in Himachal Pradesh. Matters turned worse when Shanta Kumar commented that the BJP had to pay the price for "misgovernance". He directly blamed then chief minister and rival Dhumal. Many say that Shanta Kumar could never forget the humiliation after the former pipped him to the post of CM in 1998. He never let go off any opportunity to lambast Dhumal for his government's poor track record. This outburst cost him dearly. The party's high command issued a showcause notice to Shanta Kumar, who them was rural development minister. He was also asked to resign from the Vajpayee's cabinet. Despite creating such storms, Kumar not only survived in the party, but also got elected from Kangra on a BJP ticket. However, will Narendra Modi forgive him now? Or will his fate be similar to that of BJP's former general secretary Sanjay Joshi, who was axed from the post, reportedly, because of Modi's deep hatred for him? Or will he be another Govindacharya, who was reportedly forced to leave the party for calling then Prime Minister Atal Bihari Vajpayee a mukhauta?